One of the most important decisions we make as parents is the choice we make about our child’s education. It is a privilege to be able to offer the East End, Long Island community an education that truly honors each child. The Montessori approach to education provides a classroom setting where children are able to reach their full potential, where students learn to help others, and where academic achievement is balanced with social intelligence. At Southampton Montessori School, we believe in giving our students the world — because one day they will grow up and take responsibility for this world. We do this by creating multiple opportunities for hands-on nature education; by enriching our students’ understanding of different cultures through the arts, literature, music and first-person examples; and finally, we teach conflict resolution strategies in our classrooms beginning at age three. Education is certainly the acquisition of knowledge. It also prepares our children to grow up and become adults. Ask yourself, who do you want your child to become? What qualities will they have, what competencies, and what sense of responsibility? And then ask yourself, “What should I be doing right now, to lay the foundation for these traits to develop?” Once you have asked yourself these questions, consider what kind of an educational environment will encourage the development of independence, self-motivation, personal vision, leadership, and commitment to a goal. 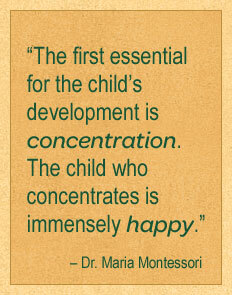 Consider the Southampton Montessori School. the need for parents and teachers to work together to serve the best interests of the child. Mutual respect and basic agreement on general educational goals is extremely important. Discussions on the Montessori philosophy and child development are held throughout the year to educate parents in the Montessori Method. Parents are invited to observe their children’s classes whenever convenient. Our observation room affords privacy and a total view of each classroom area. We’ve found that this experience has been beneficial to parents and visitors in obtaining a better understanding of the Montessori philosophy and our program. Parents are also welcome to visit their children’s classes to share their special interest, talents and occupations. Parent-teacher conferences are held twice a year and can be arranged more often when needed. Progress Reports are prepared for each conference and upon graduation.